While social critics like to go into orbit over the social isolation brought on by computer use, there is an interesting counterpoint at the time of death. As Lois and I enter the age stratosphere, we note that our friends are dying in many locations on the planet. We could become funeral junkies, traveling near and far to pay last respects. Instead, we can sign the online guest books provided by many newspapers and funeral homes. Actually, more significant comments can be left for the grieving than would be possible if we were at the funeral service. The websites of funeral homes in the vicinity of the deceased may also produce results. Now we can be much more selective about the funerals that we attend while creating a lasting presence at the memorials of many others. Lois and I were have a Bible study with a lady in her upscale home recently. In the middle of something serious, Lois began whistling. I ignored it at first in order to stay focused. But soon the others at the table began laughing. Lois was bird-talking back and forth with a male cockateel in the other room. The exchange was funny and continued for quite a while. The event lifted the study out of the realm of the ordinary. I've seen her play her harmonica for the sick, but never a visit with a bird. 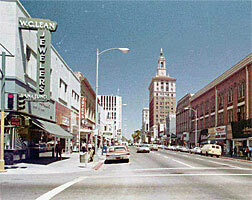 A friend in San Jose sent us a large number of old photos of the town as it used to be. One photo that we both spotted was W. C. Lean, Jewelers on South First Street. It was there that we chose a diamond ring and it was there that fragments of my meager income settled until I became the sole owner of the most important diamond on earth. South First Street has changed and the W. C. Lean company is gone. But the special rock has endured. Lois wore it for many years, then it passed to others in our family. But the little diamond remains as a family heirloom. It symbolizes love and commitment that lasts a life time. That is what God wants in marriage.